Sometimes a 3" foam block is just too thick. That's why we've created a slightly more streamline 2" Foam Yoga Brick. It's made from a sturdy, scratch-resistant foam and is lightweight and easy to use. 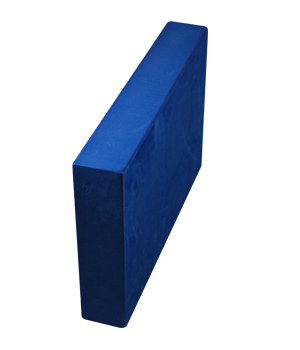 Foam yoga blocks provide support for proper alignment allowing students to practice postures safely and effectively. We guarantee these Foam Yoga Bricks will never get mushy, no matter how much they're used! Each yoga brick comes individually wrapped, and can easily be resold in boutiques and yoga gift shops. And if you do sell them in your store, remember that all of Yoga Direct's yoga bricks and many other yoga products can be custom printed. The brick shown here is 12" x 8" x 2". These blocks can help some students into shoulder stand who need a small "channel" for their neck that blankets don't provide. They are quick and light and easy to set up. A bit pricey? Very good blocks they have some give in them so they can be used for knees or wrists as well as sit on them to lift hips in staff poses. Shipping was quick and efficient to Canada! Great customer service. It is hard to find blocks that are this thin, and when I ordered them I thought that the longer length would be a minus. But, I really like the extra length of these blocks. I helps to have that length in asanas like downward dog lunge. The blocks have a nice feel as well. Not too soft or too rigid. If they could have had beveled edges like you find on thicker yoga blocks they'd be perfect. Perfect size that I was looking for. I need just a bit of extra height for certain poses and this block is perfect (instead of using a blanket). Was so pleased to find these risers as used on Aging Backwards DVDs, Classical Stretch. Had read many internet posts by others who had searched sports shops like me, and could only find the smaller, taller yoga blocks. But these blocks are exactly what we needed for these exercises, reasonably priced and received promptly. Very pleased. These were recommended by Miramda Esmonde-White of Esentrics fame to sit on while doing stretches on the mat to keep my back straight. I have normally tight ham strings so these blocks releases my lower back allowing me to do the exercises correctly. Why over adjust? Get the right brick. Doing Iyengar, it's all about correct alignment and having the right props. I bought this foam brick and cut it in half to have 2 6" x 8" blocks. I use them to make small adjustments in poses. Absolutely the best buy ever. Using a 3" brick under my hands or heels when all I need 2" has always been a frustration. Not anymore. Thanks YD! Definitely recommend to everyone. These blocks are wonderful- smaller than a conventional block they can be used for adapting many poses.